is it possibility to create Child Board ? You are here » Community Forum » New Forum Features » is it possibility to create Child Board ? Child Boards (Sub Forums) is under development. We're going to add them in February. I ask because I'd like to get my forum organized with sub-forums before launching, otherwise I'll be re-organizing things & shuffling content around while active members are posting. If sub-forums are not coming yet for another month or two, I'll have to launch anyway and hope for the best. We are still working on other tasks. Subforums there will be likely this spring. We will try not to disappoint you. everytnhig's getting better. We've been waiting for subforums for many-many long years. I've launched my forum, so I guess I'll be moving LOTS of stuff around when we get there sometime this Spring. Admin and Alex_63 had been working quite intensively to implement it but for the last two weeks as far as I concerned Admin had to deal with some personal business. May be I'll ask someone how far they have advanced on it. Beautiful piece of code, thank you! I'll definitely take it for a test drive tomorrow on a test forum I have set up. No luck, I get that "You are logged into the administration panel without add-ins. 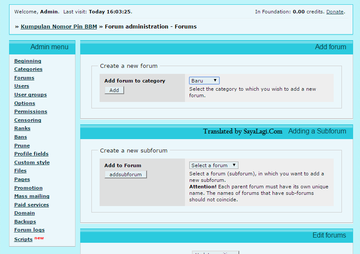 Automatic installation of subforums is disabled." message at the top of the screen, and sub-forums are indeed not available under the Forums menu. Contact the C3La-NS to discuss here ! Oh, is that his code? I'll see if I can reach him, thanks! If you break this line (selected in red), the scripts fails. Thanks for pointing out that stray line-break; I totally missed that. However, the script is still not working, I still get the message at the top of the screen, and sub-forums cannot be created. Try to re-enter to Admin-Forums, - go to the index page first, and then open the "Administration" link from the top menu. 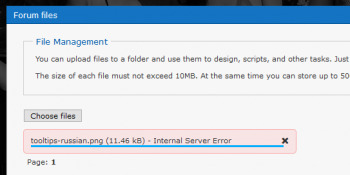 It's necessary because the link to admin panel changes after setting a script. Yes! It is finally working... thank you very much! Now on to get my forum completely re-organized! Just spent the last few hours doing just that... only had a little over 5,500 posts to re-organize. But it looks & works awesome. Thanks again! 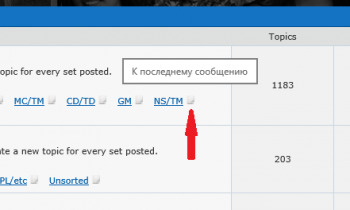 Oops, I just noticed that the title tooltips for Subforums icons with/without new messages are in Russian. Any way that can be customized to English? I guess you needn't do anything. As soon as Alex sees your post he'll customize the JS-core to fix the issues. It's handy though to know that going to /admin_index.php instead of /admin/index opens the admin without addons. That solves the file upload issue for now at least. Thanks for your post, now I've corrected this in the script, so it's fully translated into English. This is a bug that I've noticed but haven't fixed yet. I have no ideas how to make the uploader work in admin panel with subforums, so for now the only way to upload files in admin panel is going to the link /admin_files.php through the script for "standard admin" that is in kami's post. Thanks for the tooltip translation.